To the south of Punakha lies Wangdiphodrang Dzong at an elevation of 1300m. It is the last town on the highway before entering central Bhutan . This Dzong was built during the 17th century played a critical role in unifying the western, central and southern Bhutanese districts. Further up is Gangtey Gompa, an old monastery dating back from the 16th century. It is in fact the only monastery which follows the Pelling Nyingmapa sect of school. This valley of Phobjikha is also a home of the rare Black Necked Crane, an endangered species which migrate from the Tibetan plateau in winter. There are about 450-500 cranes residing in Bhutan out of which 250-300 live in this beautiful valley. We receive you at the airport with Tashi Khadar and drive you the short distance to the hotel. After Tea, we drive to Ta Dzong (built in1656 and renovated in 1968), an ancient watchtower, which now houses the National Museum . This unusual round building is said to be in the shape of a conch shell. The centerpiece of this Museum is a complex four-sided carving depicting the history of Buddhism and its propagation. One side is Sakyamuni and the great teacher Atisha, representing the Sakya School . On the next is Geylup, a disciple of Dalai Lama. Another is Nyingma lineage, the head is Guru Padmasanva, and the final is Drukpa Kagyu with the figure of Vajra Dhara. Below the museum is the Paro Rimpung Dzong (literally meaning “Heap of Jewels”, built in 1646 by Shabdrung Ngawang Namgyal, the centre of civil and religious authority in this valley. Here you can see finest example of Bhutanese architecture. Explore the ramparts and on a clear day experience an unforgettable view of Mt. Jhomolhari (7,314 m). Dinner and overnight stay in Hotel at Paro. After early breakfast, Excursion to Taktsang Monastery. A very special day, with an excursion to view the spectacular Taktsang (Tiger's Nest) monastery - After breakfast a short drive takes us to Satsam Chorten, from there a 1 hr. walk till the viewpoint point of the monastery. The trail climbs through beautiful pine forest, many of the trees festooned with Spanish moss, and an occasional grove of fluttering prayer flags. We stop for a rest and light refreshments at the Taktsang Jakhang (cafeteria) and then walk a short distance until we see, clearly and seemingly within reach, Taktsang monastery. The primary Lhakhang was built around Guru Rimpoche’s meditation cave in the 1684by the Penlop of Paro Gyaltse Tenzin Rabgay, this incredible monastery clings to the edge of a sheer rock cliff that plunges 900 meters into the valley below. Legend has it that Guru Padmasambhava, the tantric mystic who brought Buddhism to Bhutan , flew here on the back of a flying tiger, Dorji Drolo, said to be his favourite consort. After early breakfast, drive to Punakha via Dochula Pass, where you can see 108 Bhutanese Stupas. If the weather is clear, you can see all Himalays Ranges with all snow covered. Further drive to Punakha and visit Punakha Dzong. The Dzong is situated between the two rivers and it is one of the biggest rivers in Bhutan . We have to walk through the suspension bridge to reach the Dzong. The Dzong was built in 1637 by Shabdrung Ngawang Namgyal and is situated between Pho Chu ( Male River ) and Mo Chu ( Female River ). For many years until the time of the second king, it served as the seat of the Government. The construction of the Dzong was foretold by Guru Rimpoche, who predicted, “…a person named Namgyal will arrive at a hill that looks like an elephant”. There was a smaller building here called Dzong Chu (Small Dzong) that housed a statue of Buddha. It is said that Shabdrung ordered the architect, Zowe Palep, to sleep in front of the statue, while Palep was sleeping; the Shabdrung took him in his dreams to Zangtopelri and showed him the palace of Guru Rimpoche . From his vision, the architect conceived the design for the new Dzong, which in keeping with the tradition, was never committed to paper. Dinner and over stay night in Hotel at Punakha. After early breakfast, we drive toTrongsa.En route, sightseeing in the valley of Wangdiphodrang includes: visit to Wangdiphodrang Dzong built in 1638. Legend relates that as the people were searching for the site of the Dzong, four ravens were seen flying away in four directions. This was considered auspicious sign, representing the spread of religion to the four points of the compass. The Dzong is situated at the confluence of Mo Chu and Tang Chu rivers. Drive further and cross over Pelela Pass at 3250 meters. Lunch will be at Chendebji Restaurant. Visit the Chendebji Monastery. This Monastery is patterned after Swayambhunath in Kathmandu and was built in the 19th century by Lama Shida, from Tibet , to cover the remains of an evil spirit that was killed at this spot. Dinner and Overnight stay in Hotel at Trongsa. After breakfast, we visit Trongsa Dzong, the most impressive dzong in Bhutan , built in its present form in 1644 by Chogyal Minjur Tempa, the official who was sent by Shabdrung to unify eastern Bhutan and enlarged at the end of the 17th century by Desi Tenzin Rabgay. Trongsa Dzong is the ancestral home of the present Royal Family and first two hereditary kings ruled Bhutan from this Dzong. Visit Ta Dzong (Previous watch Tower to the Dzong) and have the view of whole Trongsa valley including Dzong. If you are interested make a shot hike to the village and have good photograph.The evening time is your leisure time to go around the Trongsa Small Town. Dinner and over night stay in Hotel. After breakfast, we drive to Bumthang via Yongtala Pass and Kilakha Pass. Bumthang sightseeing includes: Bhutanese Carpet Factory, here they used Yak and Sheep wool and even pure silk to weave different carpets and the Bhutanese Textiles. We take Lunch at Chamkhar Valley . After lunch, we visit Jakar Dzong, which literally means “The Castle of White Bird”. The current structure was built in 1667 and then visits Lamey Goemba, a large palace and monastery was built in 18th century by Dasho Phuntsho Wangdi. We Visit Jambay Lhakhang, built by King Srongsen Gampo of Tibet in the year 659 on the same day as Kichu Lhakhang in Paro. The temple was visited by Guru Rimpoche during his visit to Bumthang and was renovated by Sindhu Raja after Guru Rimpoche restored his life force. Under the temple is said to be a lake in which Guru Rimpoche hid several Terma. In October, one of the most spectacular festivals, “Jambay Lhakhang Drup” is staged here. In the evening, we visit Bumthang, Different Handicrafts and Bumthang small Town. Dinner and Overnight stay in Hotel at Bumthang. After breakfast, we visit Chakhar ( Iron Castle ) Lhakhang, it is the site of the palace of the Indian King, the Sindhu Raja who invited Guru Rimpoche to Bumthang. The Original palace was made of Iron and hence the name Chakhar. The saint Dorji Lingpa built the Current building in 14th century. Its correct name is Dechen Phodrang. We then visit Kurjey Lhakhang that is named after body print of Guru Rimpoche, built in 1652 by Minjur Tempa. Visit Tamshing Lhakhang ( Temple of the good message), established in 1501 by Pema Lingpa and is the most important Nyingmapa temple in the kingdom. In the evening, visit Membarstho which literally means, “The burning Lake ”. Dinner and Overnight stay in Hotel at Bumthang. After breakfast, we drive to Mongar. Packed Lunch will be served on the way. You can pass through the different vegetations and en route explore Ura valley, one of the most beautiful valley of Bhutan . There you can see the typical Bhutanese farm houses. Dinner and over night stay in Hotel at Mongar. After breakfast, we visit Mongar Dzong. This Dzong was rebuilt in 1953 and is quite small. There are around 50 to 60 monks in the Dzong, many of them young boys of eight to ten years old. The image of the Dzong are Buddha of long live as well as Guru Rimpoche ( One who brought Buddhism in Bhutan) and drive further to Trashigang. On the way to Trashigang, we have to cross over Korila Pass. After lunch, we visit the Trashigang Dzong. Dinner and Over night stay in Hotel at Tashigang. After breakfast, drive to Gom Kora. It is the small temple in the east and its correct name is Gomphu Kora. Gomphu means the sacred meditation site of Guru Padmasamva and Kora means circumambulation. The Guru meditated here and left a body impression on the rock, similar to that in Kurjey Lhakhang in Bumthang. Then, we drive back to Mongar. Dinner and Overnight stay in Hotel at Mongar. After breakfast, we drive to Trongsa and in the evening make the short hike to village. Dinner and Overnight stay in Hotel at Trongsa. You will be served Early breakfast, and then we drive to Wangdiphodrang via Gangtey. We take Lunch at Gangtey valley. It is one of the most beautiful glacial valleys of the Himalayas . We Visit Gangtey Gompa . Gyaltse Pema Thinley, the grandson and mind reincarnation of Pema Lingpa founded the Temple in 1613, and Tenzin Legpai Dhendup, the second re-incarnation, built the temple. The present Abbot, Kunzang Pema Namgyal is the ninth re-incarnation. 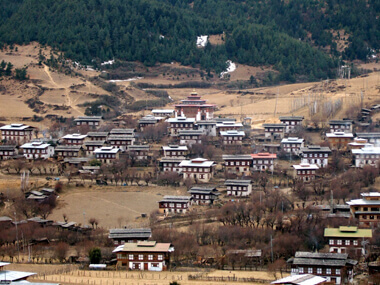 It is a Nyingmapa monastery and is affiliated to other Nyingmapa monasteries including Tamshing in Bumthang. Explore Phobjikha valley, famous for the Black Necked Cranes during winter. These cranes are very rare and endangered and highly protected by the Government. These cranes fly to Phobjikha valley which is their winter Habitat. The Cranes circle three times in a clock-wise direction around the Gangtey Gompa as a reverence to the Monastery before landing in the valley. They repeat the same practice before flying back to Tibet in early spring. You can watch the cranes. En route, we will stop in different places for taking photographs and have the view of different valleys. Dinner and Overnight stay in Hotel at Wangdiphodrang. After breakfast, we drive to Thimphu and visit Simthokha Dzong. It is the oldest Dzong in Bhutan . It is Bhutan ’s Traditional paper making Factory. After lunch, we drive to Paro. Dinner and overnight stay in Hotel at Paro. Early breakfast, we drive to Airport and farewell. Airport / Hotel / Airport pick up & drop by private car / van / bus (all airport transfers). Standard government approved accommodation (in twin share rooms) for the duration of tour. Service of licensed English speaking Bhutanese Tour Guides. All sightseeing tours, Monument /Museum entrance Fees as per itinerary. All meals fixed breakfast, lunch & dinner with Tea and Coffee for whole duration of your stay in Bhutan. Country Presentation & Tour Briefing on Day 1 evening with welcome drinks. Mineral water supply for the trek or tour. Government Royalty (which is 35% of $200) this goes to the country's health & education projects. Bhutan Visa Fees and Visa Processing assistance. Bottled/alcoholic/cold drinks, room service and al a cart meals. Photography charges (if and when applicable). Items of a personal nature such as laundry.